More than 600 people attended this past Wednesday’s Gush Katif dinner in New York. Speakers included Glenn Beck, John Bolton. More than 600 people attended this past Wednesday’s Gush Katif dinner in Crown Heights, New York. The dinner was organized by the Gush Katif Museum in Jerusalem and was endorsed by a number of leading Jewish organizations including, Americans For a Safe Israel (AFSI) and The World Committee for the Land of Israel. The Gush Katif Museum has undertaken the task of memorializing the history of Gush Katif, from the time of the Hasmoneans until the 2005 disengagement plan when residents were evicted from their homes. The speakers at Wednesday’s dinner included former United States Ambassador to the United Nations John Bolton, conservative media personality and ardent Israel supporter, Glenn Beck, Congressman Lee Terry of Nebraska, and comedian Jackie Mason. Beck, who delivered the keynote address, did not leave the audience indifferent. The passionate radio host repeatedly urged his audience to take seriously the threats of the Arabs who want to annihilate Israel, and asked them not to underestimate leaders like Iranian President Mahmoud Ahmadinejad, whose public calls to wipe Israel off the map are similar to remarks made by Adolf Hitler in the days of Nazi Germany. Congressman Lee Terry spoke of his visit to Israel and the active role he plays in Washington to help the Jewish communities in Judea and Samaria. 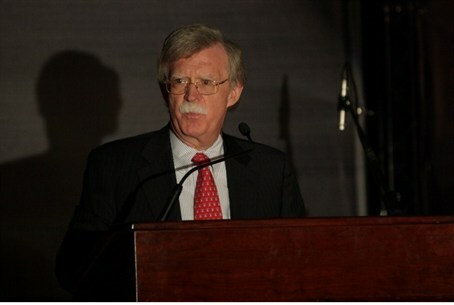 Bolton gave the audience an overview of the steps Iran has been taking to achieve a nuclear bomb. He was critical of the line taken by the Obama administration on the Iranian issue and said that instead of backing Israel up and providing it with assistance in an attack on the Islamic Republic, Obama does everything in his power to prevent Israel from attacking the country’s nuclear facilities. Bolton’s comments were made just two days before the International Atomic Energy Agency (IAEA) released a new report which reveals that Iran has significantly increased its uranium enrichment. In the report, the IAEA expressed concerns over Iran’s nuclear intentions, saying that there is “serious concern” that Iran is headed towards the development of nuclear weapons. The report also said that Iran's uranium enrichment process has only gained momentum in the last few months. Other speakers at Wednesday evening’s Gush Katif dinner included Rabbi Shalom Dov Wolpe and the director of the Gush Katif Museum, Shlomo Wassertil.